What's a muscular sports-star in a post-apocalyptic corporatist utopia to do when he's told by an executive to retire? Go to the library to 'read up on some stuff' of course! 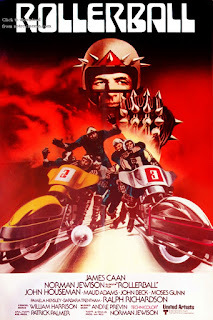 Rollerball's an odd sci-fi thriller, stylish if highly derivative of Kubrick. In a jejune future, a dozen inoffensive corporations have rid the world of want. They provide both bread and circus - rollerball. Players are meant to die young, and be indivisible from their team. But James Caan, huffing around like a wooden Brando, becomes a hero to millions of fans worldwide - his stamina and staying power (presumably) threaten the cartel. Caan goes to the library to try to understand what's going on. Outside it looks like an inverted mushroom. Inside it looks like a shopping centre. A clerk who resembles one of Isaac Asimov's sexier robots tells him that books have been summarized and replaced by computers. "So what you're telling me is that this isn't a real library and you're not a real librarian!" he says to her, which she takes quite well (maybe she thinks of herself more as an "information professional"). Later Caan goes to Geneva, home of the largest data centre, to ask questions of the largest book-munching computer. He finds a glass cube of water bubbling away, watched over by well-meaning eggheads. The aqua-computer and its minders appear to be mad. Like the computer, there's something deep and important bubbling under the surface here. The film could be about power and responsibility, the individual and society, freedom and tyranny, pleasure and politics. Instead, it's about lots of very large men on rollerskates thumping one another.